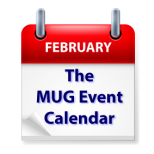 This week’s MUG Event Calendar features an appearance by The Loop’s Jim Dalrymple in California and Macman Garry Barker in Australia. Imagineer Systems will visit a California creative pro group, and Apple’s HomeKit will be the featured topic at a Virginia group. Other topics for the week include the Mac’s built-in applications, Control center on iPad, Mac Basics and flavors of Microsoft Office.